BRIGHOUSE TOWN manager Vill Powell was delighted with his squad’s showing at newly-promoted Harrogate Town on Tuesday evening despite a 3-1 defeat. The game was switched to the Vanarama National League club’s synthetic surface with Harrogate manager Simon Weaver preferring his players not to play on a firm grass surfaces at the moment. Town took a deserved ninthminute lead and held it until the 40th minute, when they could have been three more goals to the good. Powell said Harrogate had started with six first-choice players and it showed that while the standard of his side’s football was good, they needed to be more clinical. “The lads showed a great work ethic throughout and we are at a much stronger place now than we were at this time last pre-season,” said Powell. Striker Aaron Martin took a knock to the ankle and sat out the second half while Powell will also check on Connor Griffin (dead leg) ahead of the weekend’s action. 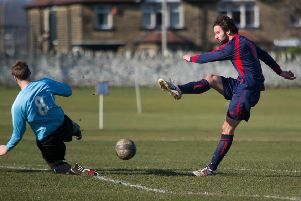 Harrogate’s players and supporters were taken aback at the pace and accuracy of Town’s football in the opening quarter. A goal had to come and did on nine minutes, when Rhys Jenkinson’s whipped ball into the box was met by Martin, who dived full length to head home. Minutes later the pacy and skilful Mohammed Ibrahim beat three defenders and just needed to pick his spot but he appeared to freeze. Martin and Jenkinson both tested ex-Leeds United reserve keeper Joe Cracknell. Harrogate were seeing more of the ball and ex-Nuneaton player Aaron Williams hit the post and had an effort tipped over by keeper Jordan Porter. The equaliser came in the 40th minute from Williams and two minutes later he made it 2-1. From the restart Tom Robinson sent in a 20-yard piledriver which Cracknell just managed to keep out. Both managers made changes and throughout the second half which continued with entertaining end-to-end play. Ibrahim had a shot cleared off the line as Halifax referee Mark Powell kept the game flowing. The hosts added to their tally in the 83rd minute when Burnley-based former Burton Albion striker Dominic Knowles hit the target after being denied 90 seconds earlier.